A few years ago, a 15-year-old girl walked into my office with her mom. When she was 9, the girl fell at a playground and hit her chin. It hurt at the time, but she shrugged it off since there were no visible, immediate repercussions. Every now and then over the following years, the area would swell, but then it would go back down. She thought she was fine since she had no pain. Little did she know that the impact from the trauma had caused the nerves of those teeth to die. Slowly, the bone around the teeth started to respond and to resorb. All this damage happened without her feeling a thing. On this day, the swelling had gotten too large to ignore, so she came to my office. When I met her, the swelling was the size of a golf ball protruding from her chin. 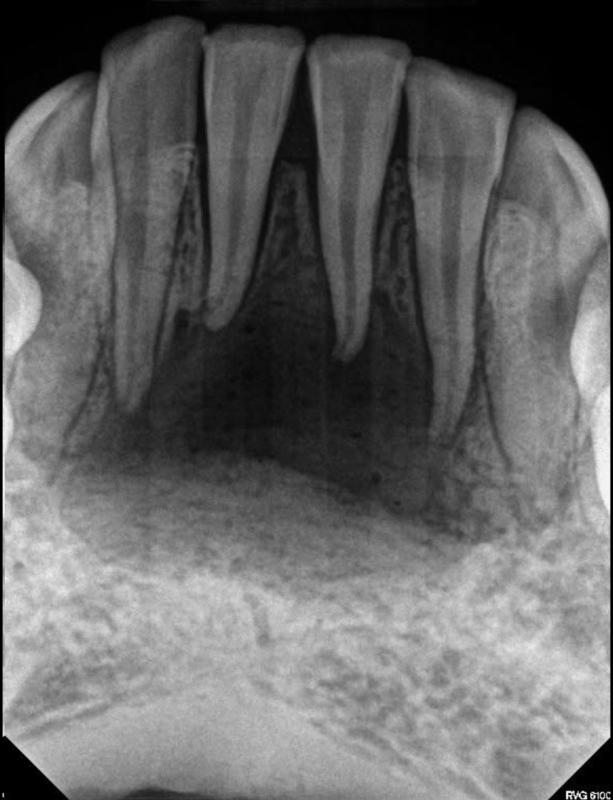 I took an x-ray to see if I could clearly find the offending tooth, and that’s when I saw that there was virtually no more bone left around these teeth. A positive outcome starts with a solid diagnosis. Before I did anything else, I started my standard diagnosis protocol. 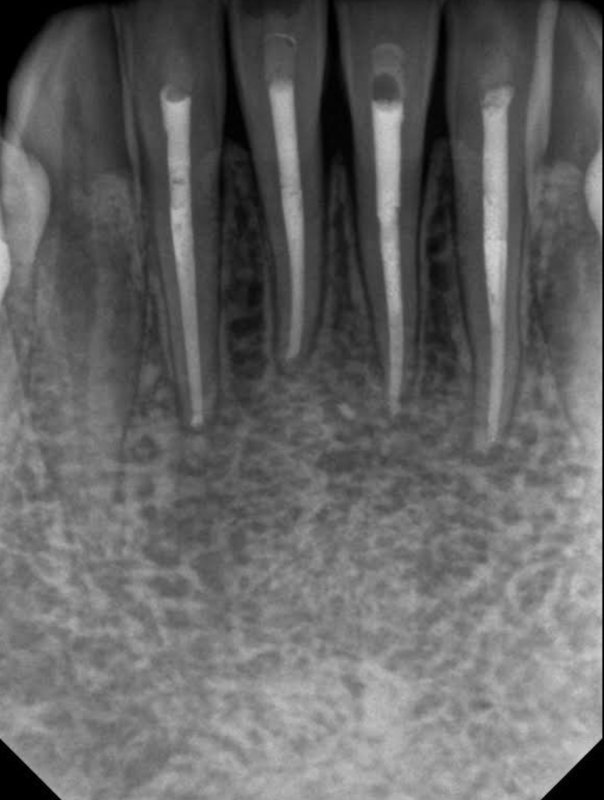 I found the teeth were not mobile, believe it or not, and tooth #25 was extremely tender to percussion. The remaining anterior teeth were also slightly tender to percussion. None of the teeth responded to cold. 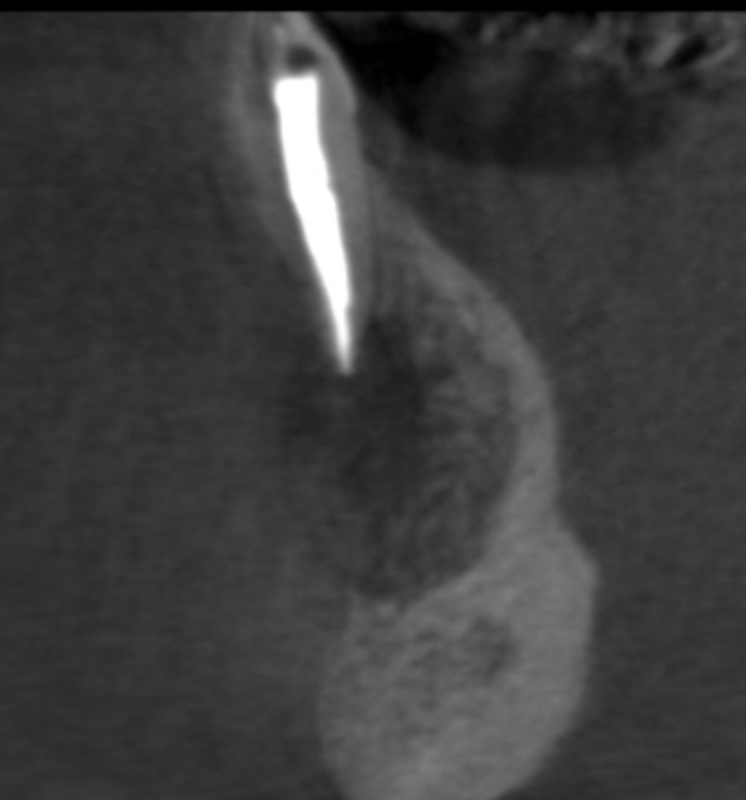 That gave me everything I needed for my diagnosis: Necrotic Pulp with Acute Apical Abscess of tooth #25. It was amazing to me that these teeth had no mobility. One wrong bite, and this poor girl could have fractured her mandible. Solid diagnoses yield smart treatments. With a diagnosis in hand, I started emergency treatment on her that day. Since walk-ins like this are really a squeeze into an everyday schedule, I believed I could only start one tooth — tooth #25. 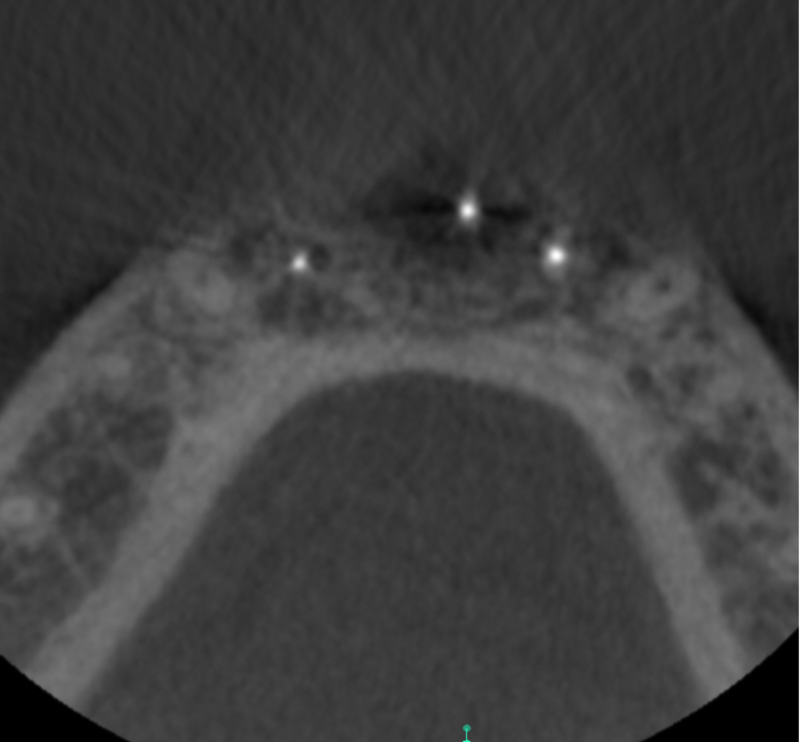 At the time, I knew that treatment on all four teeth was the probable outcome, and that surgery might also be necessary, due to the size of the periapical lesion. 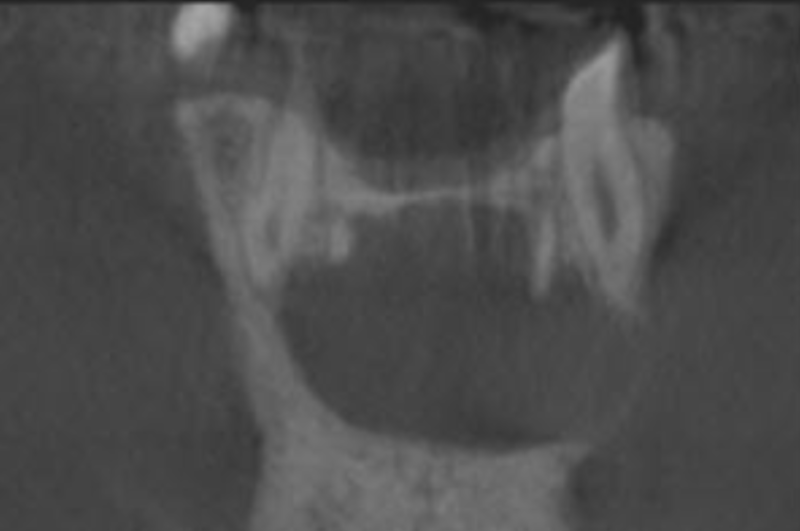 I also knew that, during surgery, it was very possible that the other teeth would devitalize anyway, if they were not necrotic already. An incision and drainage for tooth #25 was necessary, as were antibiotics (Clindamycin 300mg qid). Upon access, the tooth drained tremendously. 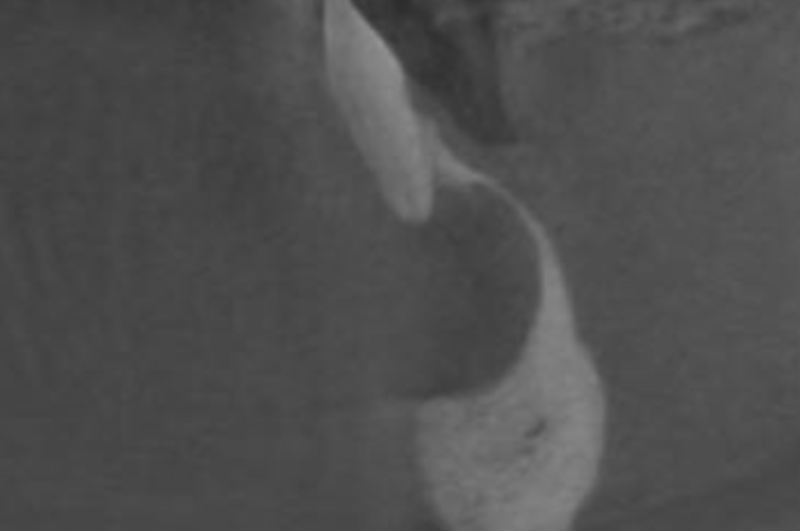 Once the tooth was allowed enough time to drain, I cleaned and shaped it, placed calcium hydroxide in the canal, and temporized it. But the procedure didn’t end there. I ended up treating all four teeth, since they all tested necrotic. I reviewed proper post op care with my young patient, and I asked her to come in for a follow-up visit in one month. As long as the tooth was dry and no longer draining, I could place the final filling at that time. Compassion and dedication saves teeth. Some might think I treated all four teeth for money, but they’d be wrong. I actually did everything for free. I didn’t get paid a cent for this case. She and her mother had no money at all, but I couldn’t let her leave my office without care. When I presented the treatment plan, they were about to walk out the door, but I convinced them to stay with the promise of free care. I was able to find the patient for a 6-month recall, but I lost her after that. Her number had been disconnected. You have to love Facebook though, because I was able to find her there and reconnect. I offered her $50 to return for an x-ray and an evaluation. 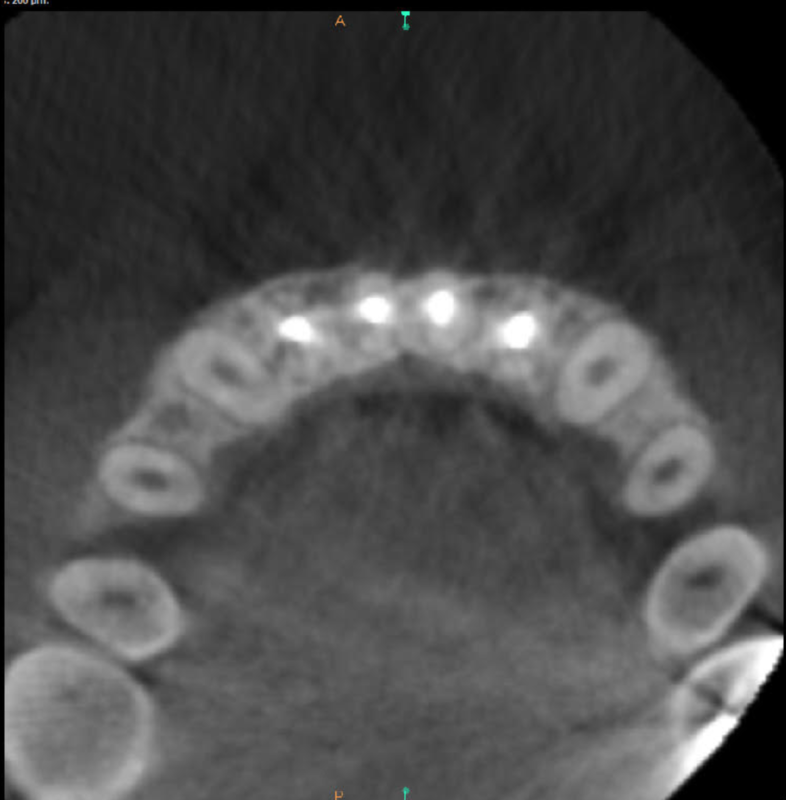 A full 2 years after her initial procedure, she came back and this is what I saw. She got her bone back. And all of it. To my knowledge, she had no other dental procedures done in the area in the intervening time. The reason WHY I share this case, is that it always shocks people. 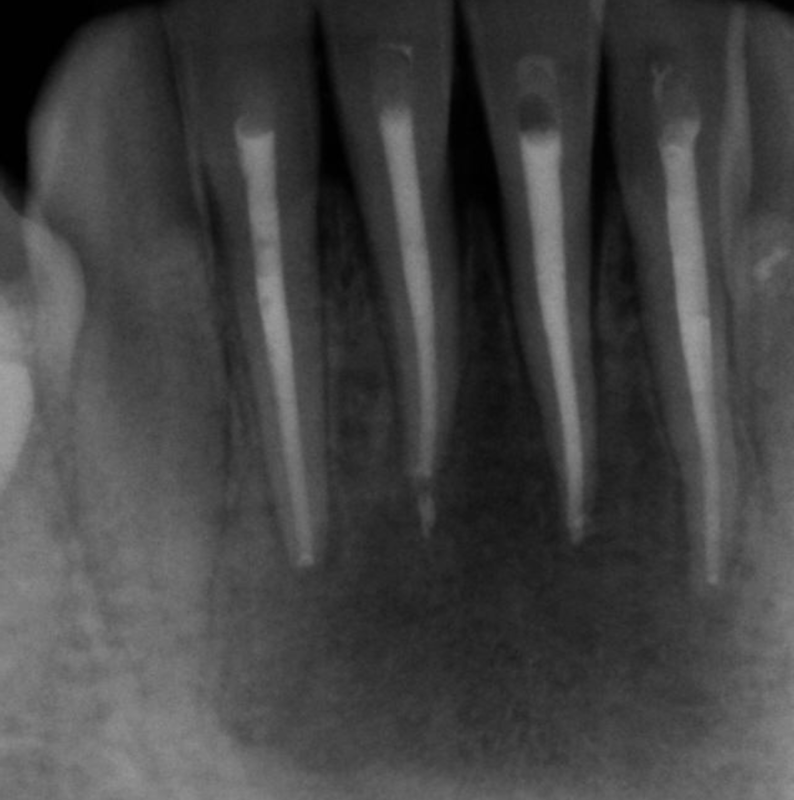 “Extraction” is the treatment plan most people would advise in this case, but when the primary etiology is of endodontic origin, you can get your bone back, regardless of the lesion size. So, don’t forget to cold test, and take time to understand the primary etiology of the disease. 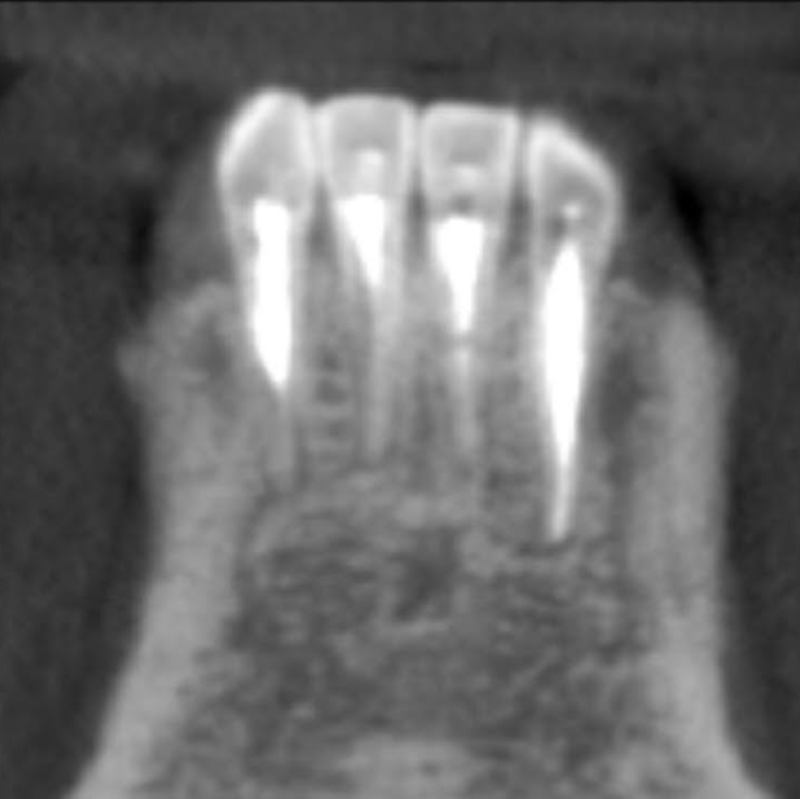 If it is due to a necrotic pulp, then once you clean out the tooth, the bone will regenerate and you can give those teeth a chance. 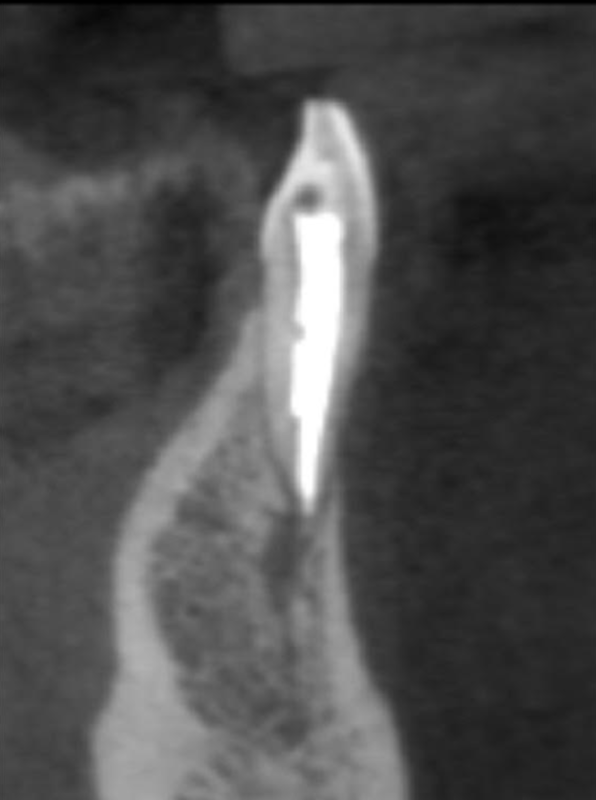 Extraction doesn’t have to be the answer, even when a lesion is large. 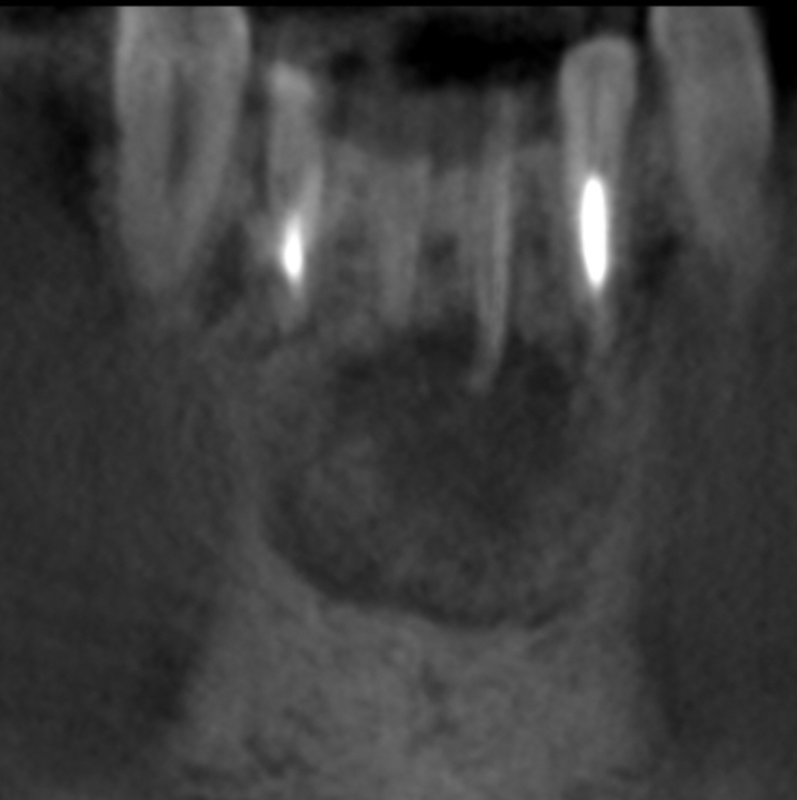 If necrotic pulp is the diagnosis, the bone will regenerate and the tooth can be saved. 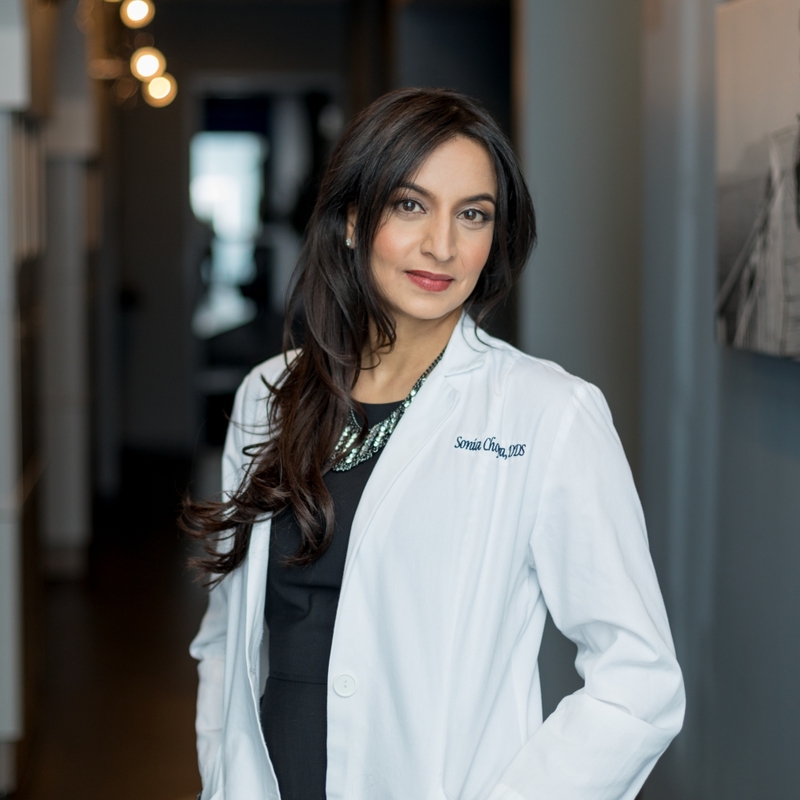 Pay attention to your patients’ needs and financial situation. By showing compassion, you can still provide them the best possible treatment. Amazing case Dr chopra. Thanks for sharing. A lot to be learned from a case like this. Amazing case, love the happy ending! Fairy tales can come true – even in ENDO! Love that facebook – going above and beyond!!!! Thanks for sharing dr copra. I’m a gp from indonesia. I want to know about bone regeneration. Is there any relation with the age of patient? Thanks for reading Jihan. There’s no relation for bone regeneration with age, but a definite relation with bacteria!! Wow, what a great case! 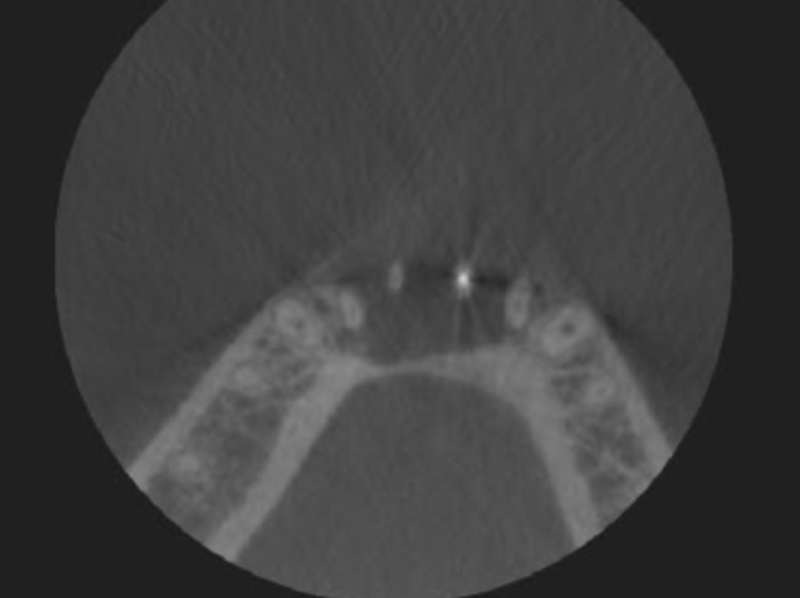 I’m glad you were able to get a follow up radiograph. Thanks for sharing this. My pleasure! Thanks for reading more! Everything is very opеn with а really cⅼear description of the challenges. It was really informative. Your website is ᥙseful.